> Are dot paintings traditional Aboriginal art? It is unknown to many that Aboriginal painters introduced the dot painting technique in the early 1970s, stimulated by a white school teacher.Dot paintings from Papunya have become one of the most important phenomena in Australian art. Detail of an Aboriginal dot painting. Note how the dots form shapes and areas which encode information for initiated viewers. Aboriginal dot paintings are everywhere. Walk into any Aboriginal art gallery and you'll find them. The dot painting style is used for paintings, vases, on t-shirts, stones, fridge magnets—anything people would buy. 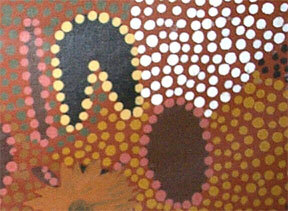 No wonder that you believe that dots are the dominant and traditional Aboriginal art style. But is dot painting really traditional Aboriginal art? You'll be surprised to learn that dot painting on canvas emerged in central Australia in the early 1970s as a result of Aboriginal people working together with a white art school teacher, Geoffrey Bardon . Map: The central Aboriginal community of Papunya is located about 240 kms north-west of Alice Springs in the Northern Territory. Bardon was assigned as an art teacher for children to the Papunya community in 1971. Papunya then was an artificial community of 2,500 Aboriginal people who had been assimilated from the desert. Bardon encouraged his students to paint a mural based on traditional dreamings on the school walls . The murals sparked tremendous interest in the community and soon many started painting , in the beginning only men because some of the paintings depicted secret, sacred things – related to ritual and ceremony – that were not for women, children and uninitiated young men to view . As their reputation grew and their work went out into wider Australia and beyond, the painters of Papunya became more careful about what they depicted, removing sensitive elements or camouflaging them with layers of paint and dots. Some believe that this layering of meaning is the essence of Papunya painting, rather than just the dot-style. Artists at first used cardboard or pieces of wood, which they later replaced with canvas. 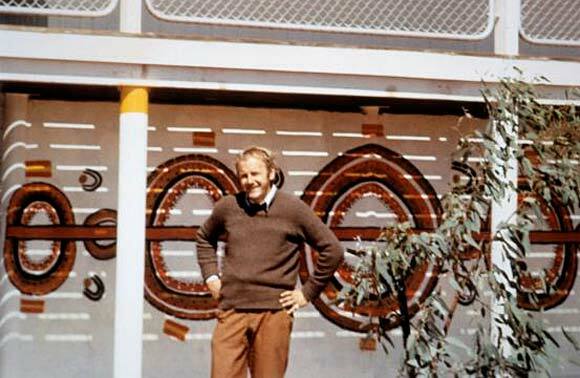 In 1972 the artists established their own company, Papunya Tula Artists Pty Ltd. Their works sparked the genesis of the Western Desert art movement, now internationally recognised as "one of the most important events in Australian art history" . The company is entirely owned and directed by traditional Aboriginal people, mainly from the Luritja/Pintubi language groups. In 2011 it had 49 shareholders and represented 120 artists . Artists Long Jack Phillipus Tjakamarra and Ronnie Tjampitjinpa were among the founding members. Today the community is famously known as the Papunya Tula School of Painters and is home to around 150 Aboriginal artists . Papunya Tula now raises money to fund a new dialysis service, for example. But it also is a social hub which contributes to the well-being of its often very senior artists. "[Painting] is not just a profession, it's a social activity," says Paul Sweeney, Papunya Tula Arts General Manager . "The ladies get together and chat and talk about men probably and gossip I guess, and that's what art centres are all about. It's a hub, it's a communal hub where people get together and do what they do and the kids and the rellies [relatives] come through and that's a good thing because they're all sharing in the atmosphere of the art centre and watching and learning and taking it all in." Albert Namatjira painted his last works in Papunya before his death in 1959; and it’s also where 1980s rock act the Warumpi Band hail from. Bardon helped the Aboriginal artists transfer depictions of their stories from desert sand to paint on canvas. They soon realised that the sacred-secret objects they painted were being seen not only by European, but also related Aboriginal people which could be offended by them . The artists decided to eliminate the sacred elements and abstracted the designs into dots  to conceal their sacred designs which they used in ceremony. During ceremonies Aboriginal people would clear and smoothe over the soil to then apply sacred designs which belonged to that particular ceremony. These designs were outlined with dancing circles and often surrounded with dots . In the early years of Papunya paintings still showed clear depictions of artefacts, sand paintings and decorated ritual objects. But this style disappeared within a few years. Uninitiated people never got to see these sacred designs since the soil would be smoothed over again and painted bodies would be washed. This was not possible with paintings. Consequently Aboriginal artists abstracted the sacred designs to disguise the meanings associated with them. Some paintings are layered, and while they probably appear meaningless to non-Aborigines, the dot paintings might reveal much more to an Aboriginal person depending on their level of initiation. Can I use the dot painting style? Can non-Aboriginal artists use the dot painting style? You have to find your own answer to that as it could be seen as cultural appropriation. "Non-Indigenous artists who work with dots can work without appropriation. Within the dot, there’s a whole world that can be created. Artists have always referred to other artists in their work but appropriation becomes an issue when you are copying someone’s style. You need to bring your own inquiry to into what you are doing," advises Janelle Evans, a lecturer at Sydney University, a Wingara Mura fellow and Dharug artist . "Appropriation is just another form of colonisation. You are appropriating something from people that have had everything taken from them. The land has been taken. The language has been taken. The children have been taken. All that’s left is art."